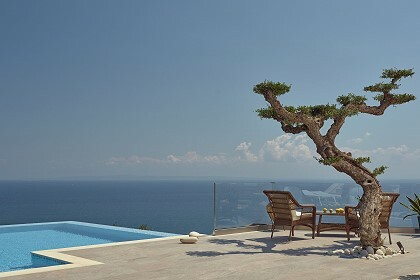 The Divine Villa is a vision of minimalism, comfort and elegance. Measuring 230 square meters, it is built in a private plot and offers many attractive outdoor facilities such as a private swimming pool, sun terrace featuring sun loungers and parasols, private parking space, BBQ and dining facilities. Inside, it is spacious and can comfortably accommodate up to 16 people. The villa is spread acroos two floors. On the ground floor you will find an open plan living room and kitchen area. The living room is spacious with adequate seating and includes a Digea flat screen TV with Netflix as well as a PlayStation (PS3). The kitchen features a large dining table and is fully equipped with modern appliances such as a large refrigerator, electric cooker, microwave oven, kettle, coffee machine, frappe mixer, Tassimo coffee machine and toaster. There are also two bedrooms, each featuring a double bed, two single beds and private bathroom with shower, WC and two sinks. A staircase takes you to the first floor which includes two more bedrooms, both featuring a double and two single, bathroom with shower, WC and two sinks. 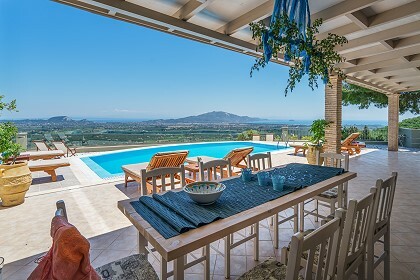 The villa is built in a private plot located in the village of Pantokratoras, 2 kilometers from the well known Laganas tourist resort where you will find many shops, restaurants, bars, clubs and a long sandy beach as well as the captivating island of Marathonisi, also known as turtle island well worth the visit by boat! If you prefer a quiet family beach with fresh fish taverns by the water, Keri village is an 8.5km drive. The island's capital, Zakynthos town (10 kilometers away) is ideal for a day of culture as there are museums adn churches you can explore.